The 32-bit RX66T Microcontroller from Renesas is commonly used for motor control applications since it can simultaneously control up to four motors with a maximum operating frequency of 160MHz. 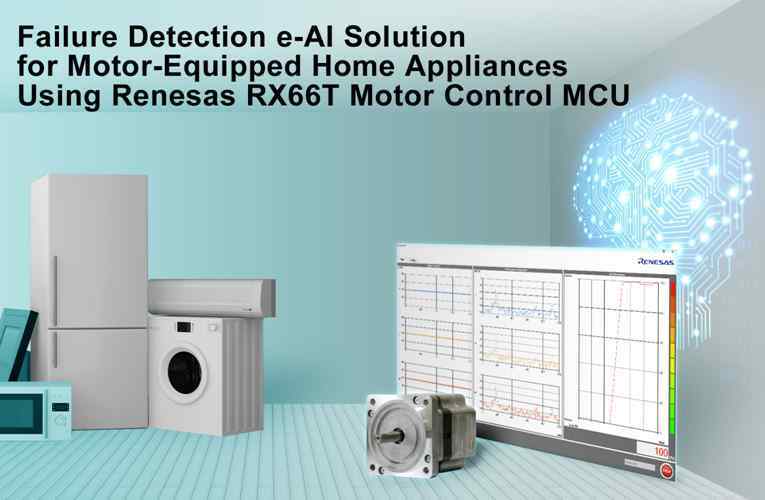 Today Renesas has announced another built-in feature called the e-AI which enables failure detection of home appliances that have a motor inside like, Washing machines, Air Conditioners, Refrigerators etc. The motors current consumption and rotating speed is directly monitored by the Microcontroller to detect any abnormalities eliminating the need of any external sensors and thus reducing the Bill of material (BOM). Today’s modern home appliances like washing machines have more than one motor to be controlled and monitored, considering this the RX66T is featured to control and monitor up to four motors. By monitoring the motor performance, not only the appliances can be saved from serious failure but can also alert the manufacturer for maintenance before even the failure occurs. This assures reliable operation of motors in critical applications. The e-AI can also be trained to understand the nature of the problem and its importance and priorities maintenance schedule accordingly.